The Rare 1797 Draped Bust Small Eagle Half Dime has 15 Stars, 16 Stars, or 13 Stars. The 1797 Draped Bust Small Eagle Half Dime has three different star counts on the obverse: 15, 16, and 13 stars. All are quite rare and are valued fairly close to one another in lower grade circulated condition. The practice of the early Mint was to add a star to U.S. coinage upon the admittance of a new state. At the beginning of 1797, there were 15 states. When Tennessee joined the union on June 1st, a 16th star was added. Toward the end of 1797, Mint Director Elias Boudinot ordered a permanent return to 13 stars, realizing it was impractical to continue adding more stars as new states entered the Union. The reason Director Boudinot settled on 13 stars is because that is the number of American colonies that declared independence from Great Britain in 1776. Some 1797 Draped Bust Small Eagle Half Dimes have 15 stars (for 15 states). Others have 16 stars (one star added to mark the admission of Tennessee to the Union in June 1797). Finally, some of the 1797 Half Dimes have only 13 stars, after it became clear that it was not feasible to add a another star to coinage upon the naming of a new state, so the number was reduced permanently to 13, in honor the original 13 states. The blue line above charts the percent value increase of the 15 star half dime since the Year 2000. 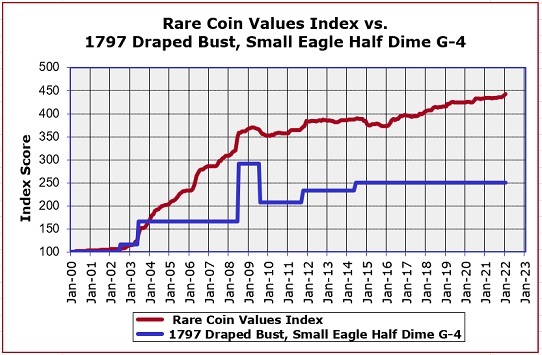 The red line depicts the value increase in the Rare Coin Values Index, which tracks the cumulative percent change since 2000 of a representational group of 87 rare US coins, which includes the 1797 Draped Bust Small Eagle Half Dime. As the graph shows, this coin has not risen in value as sharply as has the overall Index. The Index is updated monthly.